If you wish to Book a London Airport Transfer, Arrow Airport Taxis offer the very best, reliable Airport Taxi Transfer services. We always have Taxis ready to pick you up from any London Airport, or Seaport. We operate nationaly whether you are transfering from Heathrow Taxi Transfer, Gatwick Taxi Transfers and Other Taxi Transfer. Arrow Airport taxis offer a very competitive London Airport Transport service. We have access to Live Flight Information which we check regularly to ensure we reach you on time and your London Airport Transfer journey to Heathrow, Gatwick or any uk Airport goes smoothly. We will also have your mobile phone number, which you will be asked to provided on booking an Airport Taxi Transfer. The driver will contact you by text message to arrange a pickup point if you have not booked Meet and Greet. (Meet and Greet is an extra charge from £5.00). Book online or call one of our controllers to give them your transfer requirements. Tel: 0333 6000 696. AQuantus Boeing on approach to London Heathrow 27L runway. Heathrow is 14 mi (23 km) west of central London, near the south end of the London Boroughof Hillingdon on a parcel of land that is designated part of the Metropolitian Green Belt. The airport is surrounded by the built-up areas of Harlington,Harmondsworth,Longford and Cranford to the north and by Hounslow and Hatton to the east. To the south lie Bedfont and Stanwell while to the west Heathrow is separated from Colnbrook in Berkshire by the M25 motorway. Heathrow falls entirely under the Hounslow post town of the TW postcode area. 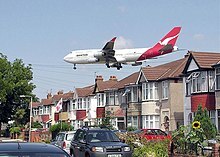 As the airport is west of London and as its runways run east–west, an airliner's landing approach is usually directly over the conurbation of London when the wind is from the west. Along with Gatwich,Stansted, Luton, Southend and London City. Heathrow is one of six airports with scheduled services serving the London area, although only Heathrow and London City are within Greater london. Heathrow Airport started in 1929 as a small airfield (Great West Aerodrome) on land south-east of the hamlet of Heathrow from which the airport takes its name. At that time there were farms,market gardens and orchards also there was a "Heathrow Farm" about where Terminal 1 is now, a "Heathrow Hall" and a "Heathrow House". This hamlet was largely along a country lane (Heathrow Road) which ran roughly along the east and south edges of the present central terminals area. Heathrow Airport is used by over 90 airlines flying to 170 destinations worldwide. The airport is the primary hub of British Airways, and is a base for Virgin Atlantic. Of Heathrow's 69 million passengers in 2011, 7% were bound for UK destinations, 41% were short-haul international travellers and 52% were long-haul. The busiest single destination in passenger numbers is New York, with over 3.8 million passengers between Heathrow and JFK / Newark airports in 2011. The airport has five passenger terminals (numbered 1 to 5) and a cargo terminal. In the 1950s, Heathrow had six runways, arranged in three pairs at different angles in the shape of a hexagram with the permanent passenger terminal in the middle and the older terminal along the north edge of the field, and two of its runways would always be within 30° of the wind direction. As the required length for runways has grown, Heathrow now has only two parallel runways running east–west. These are extended versions of the two east–west runways from the original hexagram. From the air, almost all of the original runways can still be seen, incorporated into the present system of taxiways. North of the northern runway and the former taxiway and aprons, now the site of extensive car parks, is the entrance to the access tunnel and the site of Heathrow's unofficial 'gate guardian'. For many years the home of a 40% model of a British Airways Concorde, G-CONC, the site has been occupied by a model of an Emirates Airbus A380 since 2008.